The Philadelphia Commission on Human Relations (PCHR) is a city agency established by the Philadelphia Home Rule Charter in April 1951. The PCHR, which assumed the powers and duties of the Fair Employment Practices Commission (FEPC), enforces Philadelphia’s anti-discrimination laws and mediates matters of inter-group conflict within the city. Today, the PCHR is organized into five divisions: Public Law and Employment, Community Relations, Public Information and Research, Office Services, and Housing. Adopted on April 17, 1951, the Philadelphia Home Rule Charter aimed to curb patronage in city government by increasing the power of the mayor and other executive branch offices and shifting control over municipal jobs from political parties to the independent Civil Service Board. The charter also reduced the size of Philadelphia City Council and was the first city charter in the United States to include a ban on racial and religious discrimination in city employment, services, and contracts. In essence, the anti-discrimination provisions of the Home Rule Charter and the Commission on Human Relations itself were direct outgrowths of the Great Migration of Southern blacks to Northern cities, as Philadelphia’s changing racial demography necessitated a new focus on racial equality and accommodation. In the 1940s, the city’s black population increased by 50% and, as a key constituency of a New Deal coalition that also included white working and middle-class voters, helped raise Democrats to their first municipal election victory in more than fifty years. The victory of Democratic mayoral candidate Joseph S. Clark over his Republican challenger in 1951 affirmed the power of the liberal reform movement in Philadelphia politics and marked the beginning of a new era of civil rights reforms led by the Commission on Human Relations. In its first annual report, the PCHR reflected on the passage of the Home Rule Charter and other recent government reforms and concluded that Philadelphia had very nearly created “the ideal combination of legal authority, organization, funds and community support for an effective attack on racial and religious prejudice and discrimination and for building rich and wholesome relationships among the racial, religious and nationality groups that make up America” (Countryman, p. 58). On the whole, Philadelphia’s civil rights community remained optimistic about the Commission’s prospects for achieving true reforms despite the limited achievements of its predecessor, the Fair Employment Practices Commission. In contrast to the FEPC, the Commission on Human Relations was a permanent city agency that had strong community backing, as well as the support of the Clark administration, for whom civil rights enforcement was a central concern. The appointment of several key figures in city and national politics to the role of commissioners, including prominent civil rights attorneys Sadie T.M. Alexander and Nathan L. Edelstein, enhanced expectations for the PCHR, which focused on discriminatory practices in employment and public accommodations among other issues. Throughout the 1950s, the PCHR led numerous campaigns against racial and religious discrimination in various areas of employment, from bans against hiring black clerical workers and Jewish waitresses to discriminatory union practices involving black carpenters, truck drivers, and others. Like the FEPC before it, the Commission on Human Relations primarily investigated complaints on a case-by-case basis and sought redress through private negotiations rather than public hearings, an approach that caused some to question the PCHR’s ability to achieve wholesale reforms. On a more macro scale, the PCHR passed a resolution outlawing all references to race, color, religion, national origin, or ancestry in help-wanted advertisements and pursued reforms in industries like public utilities and transportation. Nonetheless, in its 1957 annual report, the PCHR acknowledged that “the complaint procedure alone cannot accomplish the objective of full equality of opportunity” and recognized that, as discrimination became increasingly subtle, it also became more difficult to identify racial discrimination as the essential factor in exclusionary hiring practices. By 1960, as merit hiring, race blindness, and company politics all influenced employment procedures, the PCHR reluctantly acknowledged that most employers had learned how not to violate the City Charter’s ban on discrimination without significantly changing the racial makeup of their workforce, thus limiting the PCHR’s ability to transform Philadelphia’s racially segmented labor markets. As the PCHR failed to make meaningful in-roads towards equitable hiring practices, disillusioned members of the black community increasingly scrutinized and challenged its methods with direct action against racial inequities. By the 1960s, the demand for greater progress on civil rights was palpable and and the success of the sit-in movement in the South helped popularize mass protest actions. In June 1960, Revered Leon H. Sullivan’s selective patronage campaign, which encouraged African Americans to boycott businesses with discriminatory hiring practices, was a repudiation of the PCHR and underscored the degree to which many in the black community now favored protests and mass demonstrations over the PCHR’s legislative and judicial approach. This conflict continued to play out with the emergence of leaders like Cecil B. Moore, who roundly criticized the failures of Philadelphia’s liberal reform movement and pushed the PCHR to act more aggressively in matters like housing reform, school segregation, and discriminatory hiring practices. In many respects, the watershed moment for the PCHR came in May 1963, when the Moore-led NAACP picketed a school construction site in the Strawberry Mansion section of Philadelphia. In this predominately African-American neighborhood, not a single black worker had been hired in a skilled position to build the new junior high school, thus highlighting the inability of both the PCHR and Philadelphia city government to enforce the City Charter’s ban on discrimination in municipal contracts. After three weeks of protests, the PCHR eventually negotiated a deal between the NAACP and the construction industry to immediately employ five black workers to skilled positions at the site and undergo further negotiations to increase black employment in skilled trades. However, the damage to the PCHR’s prestige lingered. Faced with activists’ demands for radical change, PCHR executive director George Schermer crucially acknowledged the limits of the PCHR’s authority and conceded that the city’s antibias laws were restrictive in that they required evidence of overt acts of discrimination to be enforced. Warning that, in the absence of new legislation, activists would continue to act aggressively against racial inequities, Schermer resigned as executive director of the Commission on Human Relations in spring 1963. In spite of Schermer’s warnings, little was done to expand the PCHR’s legal powers and throughout the 1960s Cecil B. Moore and others continued to challenge the PCHR’s tactics and authority. During his tenure as President of the local chapter of the NAACP, Moore conspicuously clashed with the Commission over its response both to the 1964 Columbia Avenue riots and the NAACP picket of Girard College in 1965. Nonetheless, the PCHR continued to pursue its mission of ending unlawful discrimination in employment, housing, and public accommodations and gradually expanded its focus to include issues of gender bias and discrimination based on sexual orientation. In 2011, legislation amending Philadelphia’s Fair Practices Ordinance streamlined the PCHR’s process for investigating and adjudicating discrimination claims and updated the Commission’s scope and mission for the twenty-first century. To view primary source materials about the Commission on Human Relations and other topics in Philadelphia's civil rights history, search our collections. 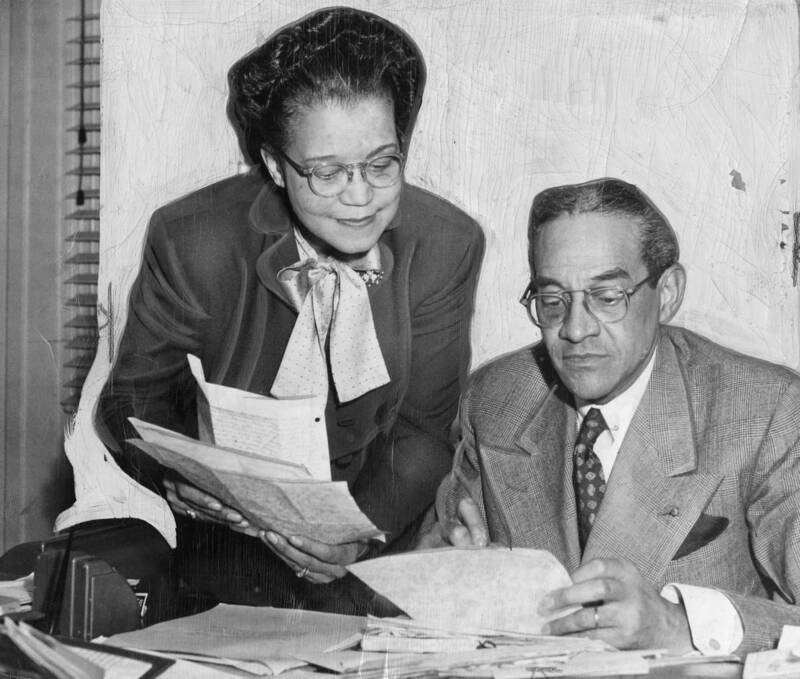 “Alexander, Sadie T.M.--Human Relations Commission--Prior to June 1963.” George D. McDowell Philadelphia Evening Bulletin newspaper clipping collection, Urban Archives, Temple University Libraries, Philadelphia, PA.
City of Philadelphia. “Philadelphia Commission on Human Relations.” Accessed April 25, 2011, http://www.phila.gov/humanrelations. Countryman, Matthew. Up South: Civil Rights and Black Power in Philadelphia. Philadelphia, PA: University of Pennsylvania Press, 2006.